This book explores the unique contributions of various forms of post-2000 life-writings such as the autobiography, epistles and biographies to discourses about the nature and socio-politics of what has become known as the Zimbabwean crisis (c. 2000 - 2009). Much of what has been written about the Zimbabwean crisis – a decade-long period of unprecedented economic collapse and political upheavals in the southern African country – is strictly discipline-specific and therefore limited to unidimensional modes of theorizing the crisis’s many and complex dimensions and dynamics. In this context, this book charts a paradigm shift in hermeneutic and epistemological approaches to comprehending the Zimbabwean crisis. 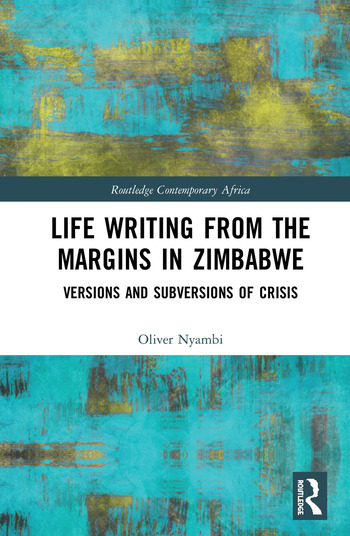 Life Writing from the Margins in Zimbabwe centres the experiences and memories of ordinary Zimbabweans in pluralizing modes of seeing and knowing the crisis. The book argues that these life-writings present a rich site for encountering versions of the crisis that relate in counter-discursive ways, to the dominant, state-authored narrative of the nation in crisis. Oliver Nyambi’s analysis contributes new ideas to ongoing debates about how cultural texts reflect on the postcoloniality of both power, and experiences and negotiations of power in the context of crisis. This book will be of interest to scholars and students of African literature, Zimbabwean/African studies, postcolonial literature, life-writing and cultural studies. Oliver Nyambi teaches postcolonial African literature and culture in the Department of English at the University of the Free State in South Africa. He has held several research positions, among them, a writing Fellowship in the Duke Africa Initiative program at Duke University, USA, and recently as a fellow of the American Council of Learned Societies’ African Humanities Program. He is currently an Alexander von Humboldt Fellow hosted by Prof. Susan Arndt in the Department of English Studies and Anglophone Literatures at Bayreuth University in Germany.